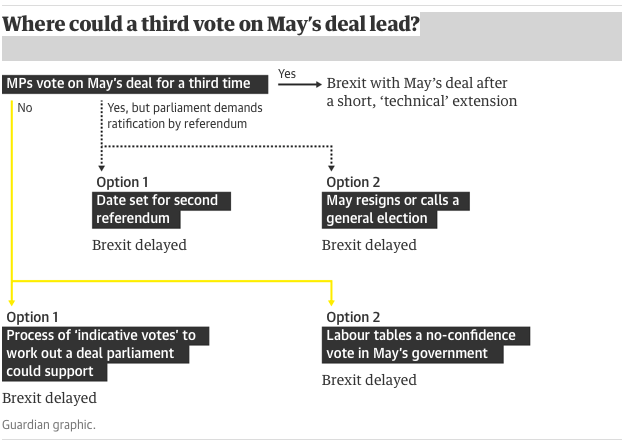 Just yesterday the Guardian published a flow chart about the options available to prime minister Theresa May when, as was expected, she resubmitted the Brexit deal that was defeated by a margin of 149 votes for another parliamentary vote, presumably hoping that a sense of desperation due to the looming deadline of March 29 might persuade enough people to switch their votes in favor of it to avoid a no-deal Brexit. But that hope was dashed when today the speaker John Bercow said that she could not bring a deal that was the same or not substantially different from the one that was heavily defeated earlier. This has sent shock waves through an already turbulent system. She cannot substantially change the deal without having discussions with the EU and it is unlikely that they will agree to major changes at all, let alone at such short notice. So that means the answer to the first box in the above flowchart is ‘No’. It looks like the only option left is to buy more time with an extension. In theory, the EU could refuse to grant one, triggering a no-deal exit. But even if, given that the UK has had two years to deal with this problem and still cannot arrive at a deal that parliament can pass, they think that no purpose would be served by granting a short extension, they will likely grant it merely to avoid playing the role of the heavy. John Bercow indicated that this was a ruling he’d need to make a few days ago. The other option (other than no deal) is to withdraw the UK’s notice of an intention to leave the EU. Which could happen if the EU refuse to give an extension to the article 50 negotiation time. More likely, I think, is a long extension (say 1 year) given on condition that the UK choses during that time which of the three possible options it actually wants: May’s deal, no deal or no brexit. They could add some extra UK-only provisions to the Withdrawal Agreement, that wouldn’t require EU agreement… Or they could try getting around the Speaker’s ruling on a technicality, by dissolving and re-convening Parliament. It’s well off the constitutional map, but that’s the thing about not having a written constitution -- you can make up the rules as you go. At this point, I wouldn’t rule anything out. US: white Christian nationalism + irrationality => Trump. UK: white Christian nationalism + irrationality => Brexit. And see what it hath wrought in both cases. My favourite example of how effed up the Leave side has been was the Tory MP, after campaigning to leave, bemoaned that May’s deal “gives us no voice, no votes, no MEPs, no commissioner” in the European parliament. How buffoonish were the Stay side if they couldn’t win against people like this? Heh -- They probably ask the same question in the UK about Trump/Dubya. The main fault of the Stay campaign, to the limited extent that I have seen it at least, is that it was incredibly timid. Not only were their arguments for staying pretty damn tepid, but they never -- o almost never -- attempted to refute the blatant lies being shouted from the rooftops by the Leave campaign. I heard it argued by a May supporter on BBC Radio 4 this morning that if she has a majority for her deal (which currently she doesn’t -- before Bercow’s ruling it already looked very unlikely she’d go for a third vote on the deal this week), then she’d have a majority for changing or suspending Commons’ standing orders (within which the Speaker has to operate). I’m not sure that’s true, because some MPS might take umbrage -- pressing for a vote on standing orders could be considered an intrusion by the government into the “rights of the House” -- and reject change or suspension for that reason. Another possibility is for May to bring her deal back next week with a few cosmetic twiddles, and dare Bercow to rule it out of order. If he does, a motion of no confidence in the Speaker could be tabled -- but it’s not clear whether he could rule that motion out of order, or whether he would have to resign even if it passed. Ideally the EU would only grant an extension if the UK agreed to hold a referendum on the polished deal that comes out of it with remain as an option -- that, if it wasn’t for the fact that the government would let no-deal occur before agreeing to one. And they would love that because they would have an excuse to blame it on the EU. But I can dream. Point of order, esteemed Professor: the decision by the Speaker was merely to enforce existing procedure, and not to allow the government’s widely telegraphed move to have a third attempt to pass their vote this week, effectively identical to the first two attempts. So no-one, least of all the government and all the MPs in Parliament, has any right to be shocked. That it even got a cynical second chance was bizarre. This is the famous “Erskine May” rule that is now this week’s word of the month. Not even a knitting circle committee would allow someone, who failed to get a motion carried, to bring it up yet again, unchanged, and in identical circumstances. But it suits our MPs to pretend their shock, because they need someone to blame for their failings over the last three years. Fun fact: Thomas Erskine May, the eponymous writer of the guide to the rules of Parliament, was the great-great grandfather of Philip May, husband of Theresa May.